Depression; fatigue; memory loss; trouble concentrating; coarse, dry skin and hair; sensitivity to the cold; constipation; and an increase in LDL in the blood, or high cholesterol, are all signs of hypothyroidism, which is characterized by an underactive thyroid, according to Dr. Nancy Snyderman. Other symptoms include weight gain, a puffy face, weakness, muscle aches, stiffness, joint pain, irregular menstrual flow and thinning hair, according to the Mayo Clinic. Sudden, unexplained weight loss; increased apatite; rapid heartbeat; nervousness, anxiety and trembling; sweating; sensitivity to heat; frequent bowel movements; insomnia; thin skin; fine, brittle hair; an enlarged thyroid; and diminished menstrual flow in women are all signs of hyperthyroidism, which is a condition in which the thyroid gland is overactive and produces too much hormone. Blood tests can determine an overactive or underactive thyroid. A quickly growing, hard lump in the neck; swelling in the neck; a pain in the front of the neck that may radiate up to the ears; voice changes such as hoarseness that are not temporary; trouble swallowing; trouble breathing; and a cough that is not associated with a cold are all signs of thyroid cancer, according to the American Cancer Society, which also states that these symptoms can also be signs of noncancerous conditions as well as other cancers of the neck. 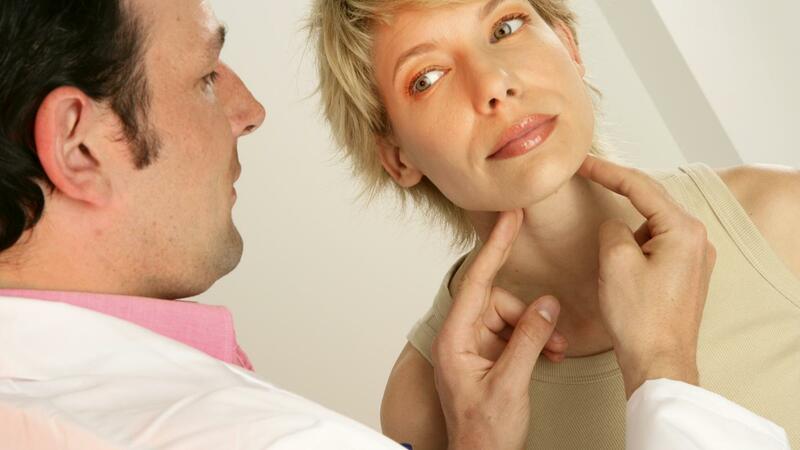 What Are Some Thyroid Disease Symptoms? What Are Some of the Symptoms of Having a Low Thyroid Level? What Are Some Common Symptoms of Thyroid Problems? What Are Some Symptoms for Low Thyroid Levels in Men?